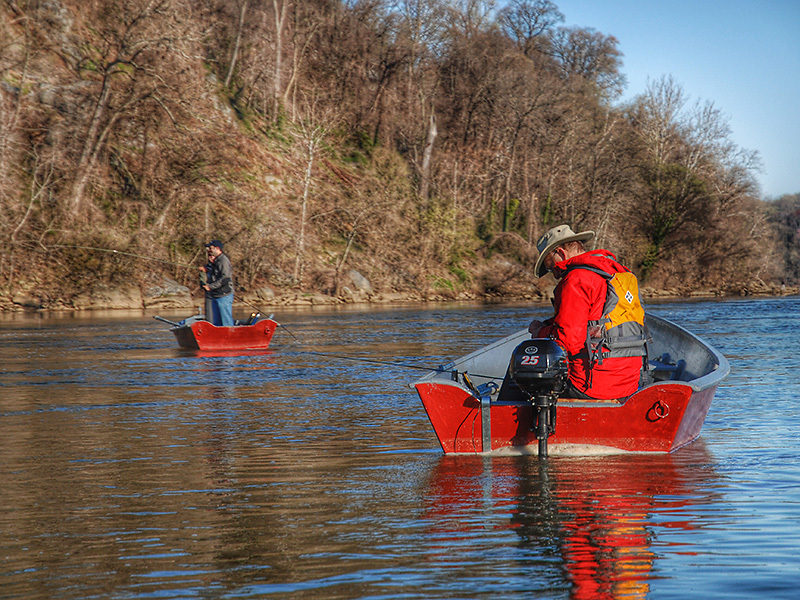 I’ve seen a lot of things float past the rowboat while fly fishing for shad. Plastic bottles, empty bait containers, someone’s dock, a telephone pole, a dead cow--all were drifting down river at one time or another. However when I saw a Fletcher’s Boathouse paddle go zipping past in the Potomac’s main current, I knew someone somewhere was having a very bad day. I was sharing a boat with Mr. Bass Master, who had fished for shad the day before and did quite well until he wedged his rock anchor on the bottom and had to cut it away. 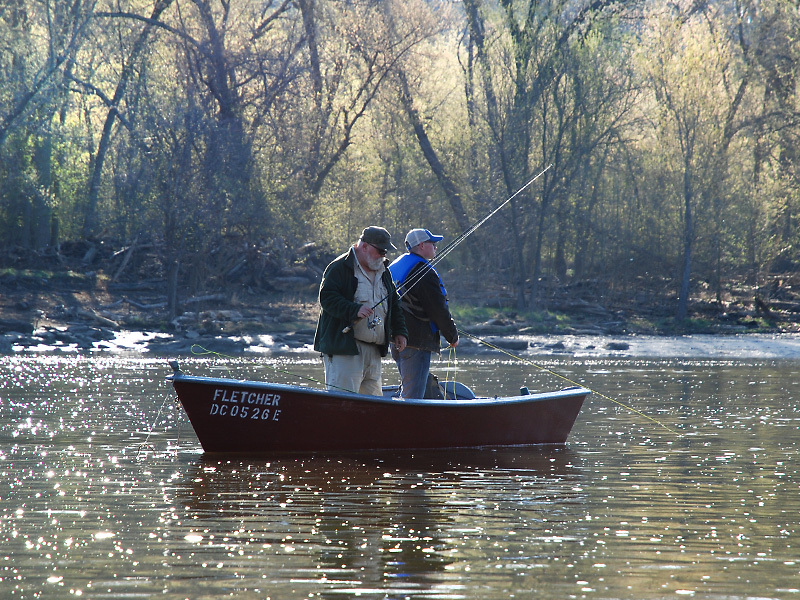 We arrived at Fletcher’s early, loaded a boat, and by the time the sun was brightening the horizon we were anchored just off the bubble trail of the main current of the Potomac River outside Fletcher’s Cove fishing for shad. Like on previous trips there was no bite for the first half hour. We were tossing flies to various locations trying to find where the fish were holding. We both fished different flies--size and color were not the same on purpose. Mr. Bass Master used the same fly that worked for him the previous day. I tossed something big and bright, thinking that the dark morning conditions called for such a fly because if a shad can’t see it, it can’t eat it. We finally got a bite and after landing the first Hickory shad of the day, and locating the area and depth where they were holding, the fishing action really took off. We pulled them in one after another. Mr. Bass Master was tearing them up and I wasn’t doing to bad either, fishing behind him. We were hooking fish in two different spots that had one thing in common--it was deep. 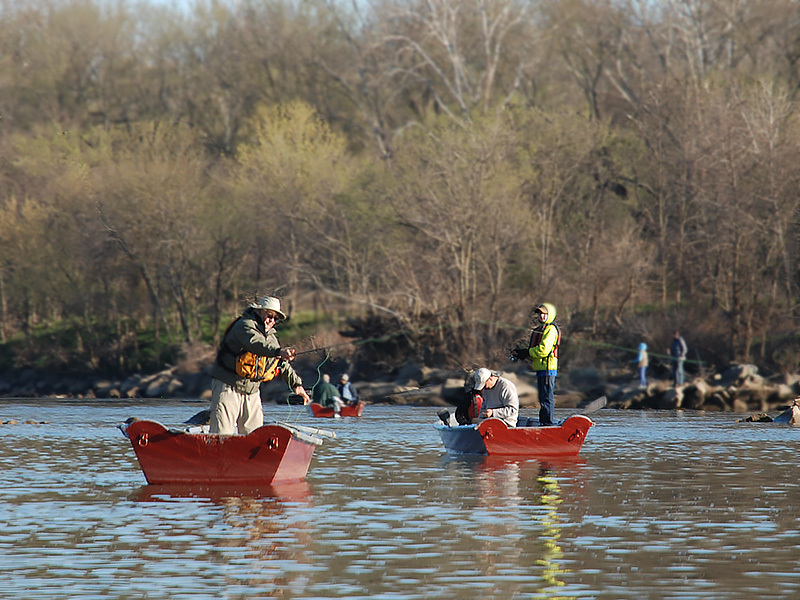 Other anglers began making their way out to the lineup and began to fish. A lot of people were laid up in the calm waters of the cove, a fairly good distance from the main current. Others were lined up in front of and behind us. As I was shaking a bunch of sinking line out of the rod guides I saw a grey Fletcher’s Boathouse paddle go past our boat, heading for Walker’s Point. I looked upstream and saw some anglers, anchored in the main current, trying very hard to use their one remaining paddle to propel their boat upstream to pull up their rock so they could pursue the missing paddle. As Mr. Bass Master and I were watching this unfold an angler anchored in front of us pulled his rock in and fired up his 2.5 horsepower motor and took off after the missing paddle. About 10 minutes later we saw him chugging back up the Potomac with the missing paddle in his boat. He returned it and motored back to his position to resume fishing. However about a half hour later I saw him pull his rock up again and fire up his motor. I thought he was either heading in for the day or to another spot to fish but I was wrong. Mr. Bass Master pointed out that the same anglers that lost their paddle, now had their rock anchor wedged on the bottom. “They’re having a REALLY bad day,” declared Mr. Bass Master. They were in the main current of the Potomac River and they couldn’t paddle hard enough to get the boat past their jammed rock so they could yank in the opposite direction to free it off the bottom. 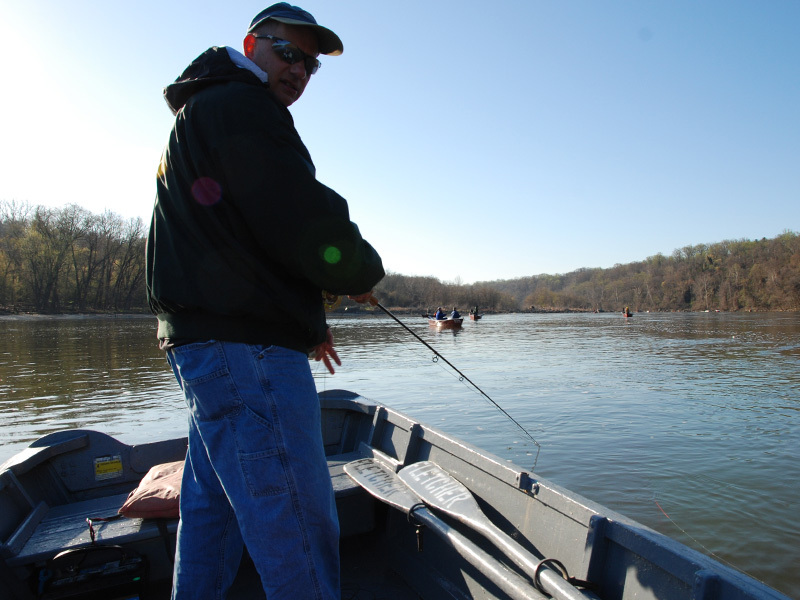 The angler with the motor moved up to their boat and after exchanging instructions, he basically told them to hang on tight to his boat, he opened the throttle and went full speed up river. Both boats sped forward and when he got them well past the jammed rock they let go and managed to pull on the line and free their anchor off the bottom. I don’t know who this good samaritan angler is, but those guys should be, and probably are, thankful that he was around today. I am certain the fishing gods will bless him with good shad karma for the rest of the season. We continued to fish through the day. The bite died down as the tide bottomed out and again when it approached peak. But in between it was pretty good and we hauled in our share of Hickory shad and I managed to hook and land my first American shad. It wasn’t a big one, but it was an American and it fought well. By 4pm it was pretty dead. We were still catching shad but it was one to three fish, then a very long dead period in between where all you were doing was getting casting practice in. At this point we were getting pretty beat, so rather than stripping the line all the way in Mr. Bass Master would let his line unwind and straighten then jig his fly. I would let my fly line get way down, give it a couple of strips until I felt the fly leave the bottom, give it a couple of strong strips then feed the stripped line back out the guides so the fly would drift back to the starting point. Usually I got a grab in the first couple of strips. We finally called it a day after the action disappeared. I told Mr. Bass Master that the action might pick up again in the evening as the tide approached the low mark but we were too beat so we called it a day, yanked up our rock and motored in for a cold Pepsi and a hot dog at the Fletcher’s concession. EQUIPMENT: I used a 7 weight Sage XP rod and an Orvis Depth Charge density-compensated full sink line. Mr. Bass Master used an 8 weight Orvis Access rod and a RIO In-Touch Deep 3 Full Sinking line. Shad flies in size 2 to 8 in various colors.